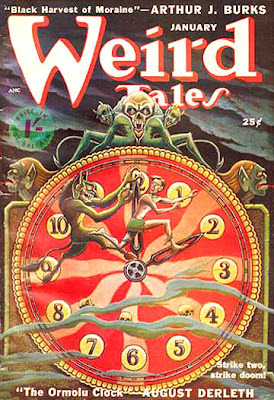 Matt Fox cover for July 1948 Weird Tales. The illustrator Matt Fox was listed in The Who's Who of American Comic Books (1971). Below is the entry exactly as it appeared. The asterisk means he wrote it himself. The parenthetical (p) and (i) indicate pencil art and inks. *MATTHEW (MATT) FOX (1906- ) Artist. Major influence: Alex Raymond; Cartoons; Adv art; Lithographs; Pulp illus; Covers of Weird Tales (oils), Color woodcuts; Water colors; Oil paintings; Etchings, Comic book credits: (p) & (i). 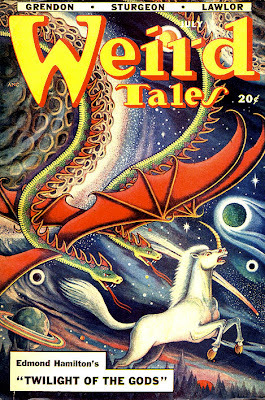 Youthful: (1952-3) fantasy; Marvel: (1952-6) horror, s-f; (1962-3) s-f, fantasy. Updated and more extensive credits for Matt Fox can be found at Who's Who of American Comic Books: 1928-1999. The year of birth means he would have been 60 years old when I met him in during the mid-1960s. This is odd, since I recall him looking much younger, very slim and fit. Attempting to reconstruct the meeting, I'm certain it must have been in the spring of 1966. Back then, on Friday evenings, I left the Port Authority in New York City and headed for New Jersey. In North Bergen, I got off the bus at North Hudson Park, where, according to UFO researcher Budd Hopkins, the owner of a Manhattan liquor store had a close encounter with "grey beings" in September 1979. From North Hudson Park, I walked half a block on Palisade Avenue to the house of Calvin Beck, publisher of Castle of Frankenstein. As the magazine's editor, I spent my weekends desperately trying to put together that publication with its zero budget and keep it on a quarterly schedule. The one year I almost succeeded, Calvin claimed the quarterly was a bi-monthly. It was like a race I could never win, a treadmill to oblivion. During the 1960s, as a staff of one, I wrote and edited copy, proofread, selected photos, designed layouts and pasted up pages in Cal's downstairs workroom. The downstairs area had three rooms, a bathroom, a large closet, a countertop with a kitchen sink and many file cabinets filled with movie stills and manuscripts. However, it wasn't a basement, since it was on ground level with a door opening into the backyard. While Cal watched television upstairs, I usually worked downstairs while listening to jazz on the radio. There were seldom any visitors, but one Saturday afternoon, I heard two sets of footsteps descending the narrow staircase. 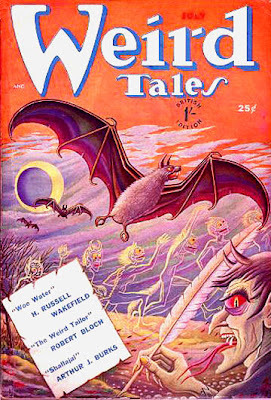 Cal squeezed past the water heater in the tiny hallway at the bottom of the stairs, entered the room with a big smile and introduced me to Matt Fox, whom I knew as one of the Weird Tales illustrators. Fox came across as a straight-arrow, no-nonsense sort of a guy, and after a brief conversation about Weird Tales, he quickly got to the point. He was selling glow-in-the-dark posters, and he wanted to run an ad in Castle of Frankenstein. With that, he unfurled his glowing poster depicting demons and banshees dancing in the pale moonlight. We took it into a dark corner of the room, and yes, indeed, it did emit an eerie green glow. He next produced an ad for the posters. He had made a negative photostat of his ink drawing, so the reversal of black to white simulated glowing monsters coming out of the darkness toward the reader. Clever hand-lettering effects added a subtle suggestion of glowing letters seen at night, not unlike the moment when Marion Crane first spots the Bates Motel sign through her car's rain-covered windshield. The style Fox had used on this half-page ad fit in very nicely with the type of art that we occasionally ran in the magazine. I showed Fox how department headings were not permanent but alternated artwork by different artists. Then I suggested that he create some similar headings. He said, "Sure, I'll do those." Calvin was grinning and nodding enthusiastically. The idea of having a few contributions by a Weird Tales illustrator was a nice addition, but in retrospect, I have to wonder why Cal didn't have Fox create a series of Castle of Frankenstein covers as outre as the ones he had painted for Weird Tales. If Cal felt that Fox's art was not in keeping with a film magazine, then he could have given him space on the back cover as we had done with Hannes Bok. Given several odd incidents that ended with artists being underpaid by Cal, I can speculate that perhaps Cal offered Fox so little money that he refused to do a painting. It's monsteriffic! It's pop art! These impressive phantasmagoric reproductions are the personal creations of famous horror-fantasy artist and cartoonist Matt Fox whose work has appeared in the Marvel Comics Group, Planet Stories, Weird Tales and many other magazines... Yes, they come horribly alive in the dark in Monsterama! They'll glow at you in Spookdracular weird green light! Bring friends (or "others") into a pitch-black room –- Then watch their reaction when they meet the Monsters From The Wall!!... Each monsterpiece is $1.98 (plus 25 cents for post & handling). Save charges by ordering 2 for only $3.98 plus only 25 cents for all postage and handling. (Please state if you want the Demons or Banshees when ordering only one.) Mail checks, cash or money orders to: Gothic Castle – Box 43 – Hudson Hts. – North Bergen, N.J. 07048. No one but Calvin Beck could ever have devised advertising copy with such a non sequitur notion as "Monsters From The Wall." Was he thinking of Charlotte Perkins Gilman's "The Yellow Wallpaper" (1892)? That same issue featured Fox's ink and pebbleboard heading for "Ghostal Mail," showing a variety of demon onlookers as Dracula and the Frankenstein Monster peruse letters from readers. Curiously, he did this in two sections, so the lettering of the heading has a different background from the illustration and is separated from it by a thin white line. That heading and the ad were repeated in issue #9 (November, 1966). 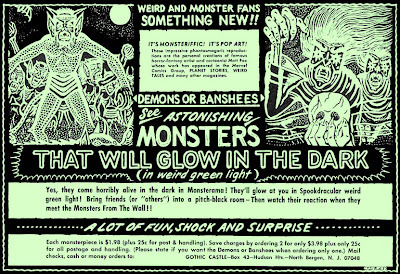 The ad ran again in the 1967 Castle of Frankenstein Monster Annual Fearbook which displayed Russ Jones paintings on both the front and back covers. Along with the ad and the "Ghostal Mail" heading, that issue also had another Fox illustration, much larger, showing a demon chasing a terrified man across a cemetery where one of the tombstones carries the words, "Rest in Peace Matt Fox," That illustration had no display lettering, but I added large display type beneath it to make it work as a heading for the fanzine review column, "CoFanaddicts." On the Saturday Fox arrived to drop off that cemetery illustration, it was the second time I saw him. I admired his tight rendering in ink and crayon on pebbleboard. Then I casually asked, "So how many orders did you get for the glow-in-the-dark posters?" He responded bitterly, "None." After that day, I never saw him and his demonic entourage again. He became the Phantom Artist, whereabouts unknown. Fox died in 1988, as noted by Marty Jukovsky in one of the comments below. After Orion Pictures went bankrupt in 1991, they eventually vacated offices at 1325 Avenue of the Americas, so an odd series of synchronous events resulted in Daryl and I working in a huge CEO-type office once occupied by some top Orion exec. It overlooked both the Sheraton and the Hilton, and the wide ledge with railing just outside the windows provided a covert perch for the Secret Service when Bill Clinton stayed in those hotels. Each year, Joe's department had to devise the DC Comics Christmas card. One year, the idea was to have Charles Vess draw Swamp Thing as a Christmas tree, and during a meeting in Joe's office, James McCann wrote the clever pun, "Season's Greenings," for the card interior. 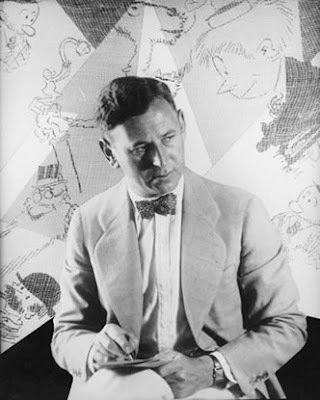 After Mad publisher Bill Gaines died in 1992, Time-Warner eventually decided that Mad should be under the wing of DC Comics, and Joe was given the position of Associate Publisher of Mad. 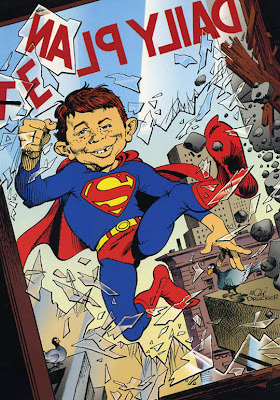 For the 1994 DC Comics Christmas card, Joe wanted the long-time Mad cartoonist Mort Drucker to draw Alfred E. Neuman as Superman. I came up with the line, "What, Me Merry?" (see reduction of card interior below). Daryl got on the phone to contact Mort Drucker. Then came some problems. When it was all over and the card was printed, I stared at it in disbelief and said, "Daryl, this is really odd. There's nothing here about Christmas. No tree, no wreath, no Santa cap, nothing. We blew it." "Drucker would take no direction, and because he was Drucker, we let him do what he wanted. That's why there's nothing about the holidays in the card. I talked to him for a good half-hour on the phone. You were offering suggestions, and I kept shaking my head that he didn't want to do anything we asked. He said he would draw Alfred in a Superman suit, and that was all. I asked if he would at least draw him in a Santa hat. He wouldn't draw the Daily Planet, and that broken window with the backwards lettering was his compromise. We explained the whole episode to Joe, and when the drawing came in, Joe laughed and laughed. He liked it anyway." 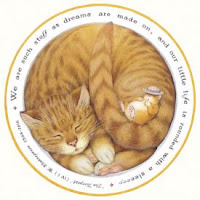 "When we dream of childhood," said Dennis Potter, "we take our present selves with us. It is not the adult world writ small; childhood is the adult world writ large." Potter viewed childhood as "adult society without all the conventions and the polite forms which overlay it," so the cruelty of children emerges in Potter's Blue Remembered Hills (1979), a theme also explored by Ray Bradbury ("The Playground") and Margaret Atwood (Cat's Eye). For Blue Remembered Hills, Potter employed the device he had introduced 14 years earlier (in Stand Up, Nigel Barton): children's roles were cast with adult actors, providing "a magnifying glass to show what it's like to be a child" in this naturalistic memory drama of a "golden day" that turns to tragedy. On a sunny, summer afternoon in bucolic England of 1943, seven West Country children (two girls, five boys) play in the Forest of Dean. Their games and spontaneous actions (continuous and in real time) reflect their awareness of WWII, but no adults are present to intrude. As the group moves through the woods and back to the grassy hills, their words and actions illustrate how "childhood is not transparent with innocence." When the two girls (Helen Mirren, Janine Duvitski) push a pram into a barn to play house, the casting concept is heightened, doubling back on itself in a remarkable moment: adults are suddenly seen to be acting as children who are pretending to be adults, and lines from Housman echo across the years. Cast: Colin Welland (Willie), Michael Elphick (Peter), Robin Ellis (John), John Bird (Raymond), Helen Mirren (Angela), Janine Duvitski (Audrey), Colin Jeavons (Donald), Dennis Potter (Narrator). Potter reads the Housman poem at the conclusion. Oddly reminiscent of Potter and Housman is this video of Glósóli by Sigur Rós, filmed in Iceland in August 2005 by directors Stefan Arni and Siggi Kinski with Swedish director Ted Karlsson. For commercials and more music videos by Arni and Kinski, go here. The same year that Housman wrote his poem, Ernest Dowson (1867-1900) wrote the poem that gave JP Miller the title for his Days of Wine and Roses teleplay (originally on Playhouse 90 in 1958). The poem's title is from Horace's Ode I and translates as: "The shortness of life prevents us from entertaining far-off hopes." 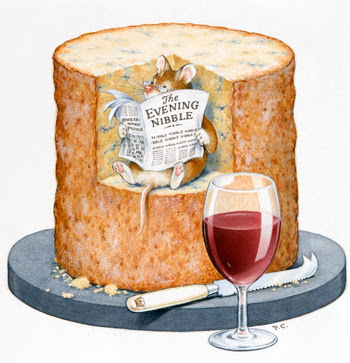 Getting into the Christmas spirit, here are Dreams and The Evening Nibble by Peter Cross, who created these watercolors as greeting cards for The Great British Card Company. For more by Cross, go here. "The cards that I do now, I probably do about two a week, and the details on the picture take the longest amount of time... All from my own imagination. It's not a tortuous process, it's something that I enjoy and see as a challenge. What can be tortuous actually is trying to stop the flow of ideas and selecting and rejecting ones. So sometimes my biggest problem isn't trying to think up ideas but having too many and the feeling you have then of overload, and it's not a pleasant thing. So what you need then is an ability to select objectively, and that comes with experience and knowing which ideas are successful. I'm lucky getting the feedback on which cards are selling well and which ones aren't and knowing that anything that has got booze on it will sell. In terms of sales or anything like that, I've never actually counted them, but I suppose I must turn out at least a hundred a year. And I've been doing them now for a couple of years, so there must be at least two hundred." 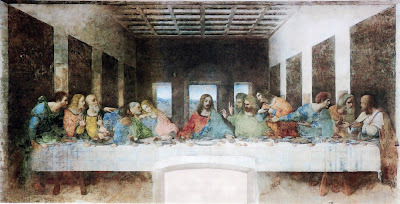 Yes, I know the news story about Giovanni Maria Pala's discovery of the music encoded in The Last Supper was current a month ago. But I wanted to post a video with more complete coverage, and I thought a good clean audio of the music must be somewhere within reach. Pala's book, La Musica Celata (The Hidden Music), is only in Italian and has a CD inside the back cover. Click on title above to hear a short audio clip of the music. And here is the 16 billion pixel Last Supper with different music and tools for enlarging the painting to amazing details. Finally, below, Pala explains how he made the discovery. 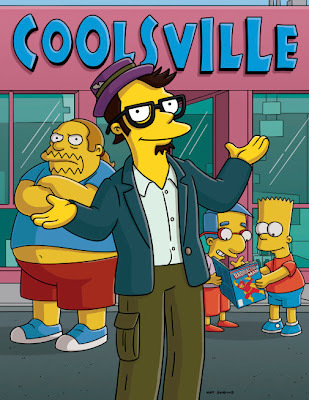 The "Husbands & Knives" episode of The Simpsons (11/18/2007), featuring the voices of Alan Moore, Art Spiegelman, Dan Clowes and Jack Black, is available here. Moore, Spiegelman and Clowes appear as the Legion of Extraordinary Freelancers. The episode's satire on the comics industry is so effective that one wishes the final 15 minutes had kept going in this direction. But stay tuned, as the trio of alternative creators returns for a brief scene at the finale. Professor Butts' "Self-Operating Napkin" is set in motion when soup spoon (A) is raised to mouth and pulls string (B), jerking ladle (C) which throws cracker (D) past parrot (E). When parrot jumps after cracker, perch (F) tilts, tossing seeds (G) into pail (H). Extra weight in pail pulls cord (I), which opens and turns on cigar lighter (J), setting off skyrocket (K) which causes sickle (L) to cut string (M), making pendulum with attached napkin swing back and forth, thereby wiping chin. Substitution of harmonica for napkin creates after-dinner entertainment. Rube Goldberg draws more gadgets in this 1940 short film, Something for Nothing (8:47), which features two brief bits of animation. It was produced by the Jam Handy Organization for Chevrolet.